Even though it has only been on the market for a matter of weeks, Halong Mining’s DragonMint T1 is quickly establishing itself as a viable rival to Bitmain’s near-ubiquitous Antminer S9 bitcoin miner. Both miners offer a similar level of performance and efficiency — the T1 having a slight edge over the S9 on most metrics — and at a comparable price point. But there is one factor that sets the DragonMint T1 apart: Samsung. Yesterday, Halong Mining confirmed that the T1’s mining tech is built around a new generation of 10nm chips from Samsung’s foundry, removing any doubt that the South Korean tech giant is staking a claim in the cryptocurrency mining industry. Halong Mining retweeted this photo of the silicon wafer used in the manufacturing of their DragonMint T1 bitcoin miner. The 10nm chip was designed and manufactured by Samsung. Samsung’s eventual entrance into the cryptocurrency mining industry has been common knowledge since January, but the company and its partners have been fairly quiet about the specifics. In fact, Samsung’s involvement hasn’t been a part of the DragonMint’s marketing — there’s not even a mention of Samsung’s chips on Halong Mining’s website — suggesting that Samsung has been intentionally downplaying its role. 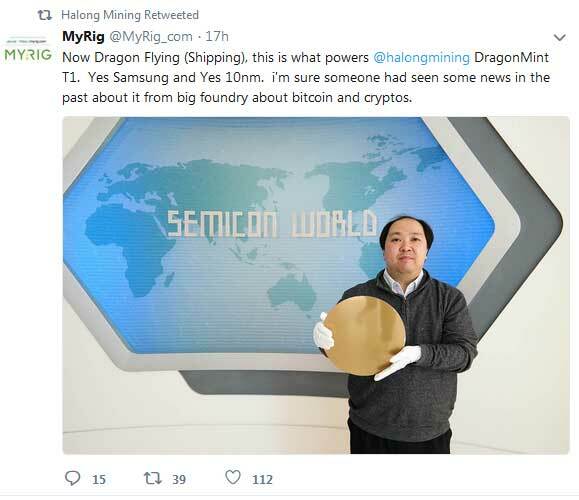 Earlier today, however, Halong Mining’s official Twitter account retweeted a photo showcasing the 10nm Samsung ASIC silicon wafer used in the T1’s hardware, confirming the relationship. The nature of Samsung’s relationship with Halong Mining remains unclear. It’s possible that Samsung’s chips — which are built to make use of ASICBoost technology — will be widely available to multiple mining hardware manufacturers. If true, the T1 would simply be the first such product to make it market. It’s also possible that Halong Mining’s partnership with Samsung is more exclusive — with the South Korean firm providing anything from financial backing to distribution support — although no details supporting this possibility have yet emerged. Samsung’s involvement does present a serious challenge to Bitmain’s virtual monopoly in the bitcoin mining industry. Bitmain’s fifth-generation S9 line is still using an older line of16nm chips, delivering slightly less efficiency and performance than the first-generation of the 10nm Samsung/Halong line. As Samsung’s process and designs become more refined, however, Bitmain could be left in the dust. Samsung also has a huge advantage in terms of efficiency of scale, with ready access to some of the world’s most experienced chip engineers and a state-of-the-art facility. Should Samsung go “all in” with cryptocurrency hardware, miners won’t even need to check the details on a bitcoin calculator to see which ASIC maker offers the better deal.